Home Editorials Where is the New Season of ‘Twin Peaks’ Going? It’s nothing short of amazing to me that in 2017 Twin Peaks has become a phenomenon once again. Hundreds of thousands of viewers are tuning in each week and collectively witnessing something that Television has never given the general populous before. It’s a surreal, abstract, art-house hour of programming. Plot? Pssh. Who needs it!? That’s a little bit of a joke – there is a plot to the new season of Twin Peaks, but it’s being told in the most Lynchian way possible. So far, we’ve learned that a mysterious killing has taken place and the victim is Garland Briggs. 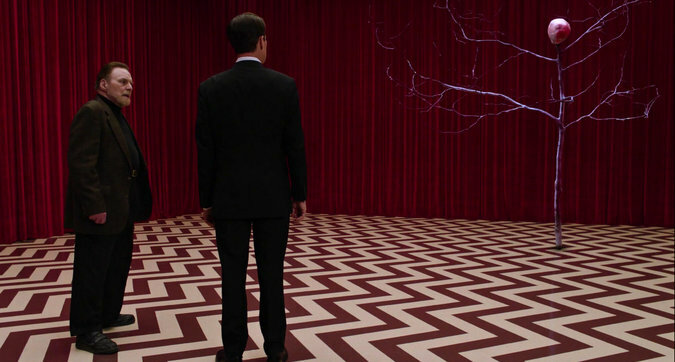 Agent Cooper has made it out of the Black Lodge, though he now inhabits the body of a man named Dougie. Bob is still in control of Evil Coop, and he’s just escaped jail before being shot and resuscitated by eerie homeless people. Just as Cooper seems to be on the path of full recovery, David Lynch does what could now be totally expected of him and completely shifts gears. A straight trajectory? Never! How about instead, we flash back all the way to the first testing of the atom bomb? Of course! In the aftermath of the explosion, we see a ghostly figure vomiting what appears to be fluid releasing the entity that is known as Bob along with it. A globe that contains Laura’s face appears as well. What does this mean? Where are Lynch and Frost going with all this? I don’t know. I don’t think there is a definitive answer to it, either. Which is the main point of this article: much like Eraserhead, I believe that much of the new season is supposed to be open to any and all interpretation. This is a show hell bent on creating mood and atmosphere. The story is buried somewhere in there, but it’s up to only the most astute of viewers to find it. So much is said in subtext. Much more than I have ever seen in a TV show ever before. Here is what I think. In Episode 7, it appeared to show Cooper emerging from Dougie’s subconsciousness and burst into action when a tiny assassin attacks him. His survival instincts kick in, and a part of Dougie’s brain, now shared and seriously confused by the presence of Cooper, allows Cooper to break through and defeat his attacker. While many (myself included) believed that Episode 9 would reveal Cooper’s ultimate comeback, it jumped back half a century instead to show the birth of Bob. Bob is created by the detonation because the atom bomb is the presence of pure, unfiltered destruction. An evil was brought to the earth that very second by mankind’s thirst for violence. This desire for death is so powerful that it awakens something out of space and out of time; Bob. At the same time, Laura’s eventual birth becomes decided. She is a beautiful, pure spirit, and will ultimately be corrupted by the evilest thing to walk the earth. Were their fates intertwined from the beginning? Is this proving that Laura’s murder has a much bigger, much more sinister implication than a tragic event in a small town? I think so. And I also think that Cooper will reveal himself in Episode 9. We have a week break to catch up and ponder over everything we’ve been given thus far. So, if Cooper doesn’t come back in the next installment, I am fairly certain that something big will happen. The second half of this story is about to begin. Is my theory correct? Who knows? I’m not so sure that there is a correct answer. Your interpretation may be entirely different than mine, and in a way, both will be correct. The biggest thing to consider is not what is actually going on in the show, but how the show is making you feel. So – just how is it making you feel?